I know just what you’re thinking: summer is just about over. The cross-country flight has been flown and the week at the beach is over. I hear ya. But a long weekend is but a few weeks away (Labor Day) and it’s never too late to pick up some great books for the Fall (or for, gasp, the holidays). I read this book one year ago. I purchased the book expecting to hear about Tony Hsieh’s approach to delivering great customer service at Zappos. And while the book does include insights related to that, it’s scope is really much more. Hsieh relates a compressed life story (his own) and how he sought to discover meaning and happiness. The book is filled with a series of entertaining personal anecdotes. Hsieh wraps things up by discussing the science of happiness and declares that the meaning of life is to discover it. This is my favorite book of all time and has completely changed my outlook on life. For the better. Read my prior book review on Delivering Happiness. Earlier this year, Medina was the keynote presenter at a conference I attended. I couldn’t attend Medina’s session, but I knew from the related tweets that the audience found it interesting. Later, I’d bump into other attendees and Medina’s session was mentioned often. I decided (then) to add “Brain Rules” to my reading list and it didn’t disappoint. Medina is a neuroscientist and the book helps us understand how the brain works. This understanding can help us design more effective meetings, classes, events and more. Read my prior post on how to use Brain Rules to make your next event more impactful. Coincidentally, Jane McGonigal also provided a keynote presentation at the same conference (as Medina). While I also missed McGonigal’s session, I had already read her book. McGonigal presents research from a number of scientists to explain “why games make us happy” and describes how games can be applied to solve problems at a global scale. I liked this book so much, in fact, that I organized a digital book club in which we assembled via Google+ Hangouts to discuss portions of the book. Read my favorite quotes from the book. Thompson’s book makes an impact right from the first page. She describes rollerblading down the street. They were the streets of New York City and she was headed south towards the World Trade Center. And it was September 11, 2001. 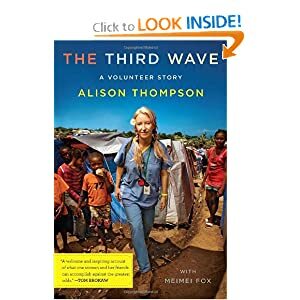 Thompson, who has training as a nurse, provided emergency response to victims (on the streets) and witnessed the collapse of the second tower. She volunteered day and night in the days immediately following 9/11 and returned there for weeks afterwards, lending a hand each and every day. It’s not just touching, it’s inspirational. Reading about Thompson’s selfless acts have inspired me to “do more” for the larger world around me. 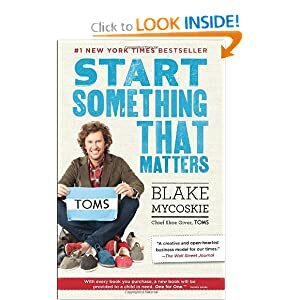 This book is the story of TOMS, a shoe company who matches “every pair of TOMS (shoes) purchased with a new pair given to a child in need.” (they now sell more than just shoes). Like “Delivering Happiness,” the book does more than just tell the story of a company’s growth. I hope you found my recommendations useful. If you end up reading any of these books, return here to leave a comment. I’d love to hear your feelings and reactions to reading them. This entry was posted on Thursday, August 9th, 2012 at 5:05 AM and is filed under General. You can follow any responses to this entry through the RSS 2.0 feed. You can leave a response, or trackback from your own site.